According to Christian tradition, Pentecost is always seven weeks after Easter Sunday; that is to say, 50 days after Easter (inclusive of Easter Day). Pentecost commemorates the descent of the Holy Spirit upon the 12 apostles and other followers of Jesus as described in Acts 2:1-31. 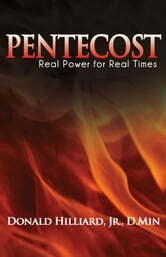 Pentecost is sometimes described as the "Birthday of the Church." The problem is, many of our churches do not celebrate it! This devotional has been designed to prepare you for the refreshing. I have revised several sermons that I preached within the last five years on Pentecost, with the intent to prepare you for the second wind of God. If you are open to the Spirit, you will desire a refilling of the Holy Spirit. If you are willing to drop all pride and receive from the Lord, your next 50 days will change the course of your entire year. Drink deeply as your journey through the following three sections: Remembrance will call back to memory who the Holy Spirit is. Restoration will increase your understanding of Gods new expectations for your life. Revival will stir up the gifts again, giving you a new passion and zeal to bring down the fire of God from heaven. Where Can Broken Hearts Go?